In August of 1897, while investigating the disappearance of water into a sinkhole in a nearby field, a farm boy discovered a grouping of underground passageways. After digging down a few feet, he uncovered an opening to a cave that had started forming as early as several thousand years earlier during the Ice Age. The cave, which was formed out of soluble limestone bedrock, is estimated to be approximately 400 million years old. Ground water dripping through the cave's ceiling formed stalactites, stalagmites, and a mineral coating all over the cavern's walls, floor, and ceiling. Not long after its discovery, the Caverns opened for business. The original 100 acres purchased for the caverns is situated in between both Champaign and Logan Counties, making it a centrally located destination for many in our area. In 1925, a more geologically interesting section of the cave was uncovered, and the original opening was closed. In that same year, the Caverns were incorporated. Since then, Ohio Caverns has become one of Ohio's top tourist destinations, attracting visitors from all over the state, country, and the world. The Caverns is home to Ohio's largest known cave system, with over 2 miles of passageways. The depth in the passageways ranges from 30 feet to 103 feet at its deepest. Inside, amongst a wide array of formations and features which come in all different colors, ranging from blue, to orange, to reddish black, is the most famous formation of allthe Crystal King. At almost five feet long, 400 pounds, and over 200,000 years old, it is one of the largest and most perfectly formed stalactites in history. Guests who visit the Caverns have several different options for tours during their Summer Session, which occurs May 1st through September 30th. Those include: The Natural Wonder Tour, The Historic Tour, The Combo (a mix of the Historic and Natural Wonder), and the Limestone Tour, which is designed for guests with limited mobility. During their Winter Session, visitors can enjoy a tour with highlights from the Natural Wonder Tour and the Historic Tour, plus a section of the cave not toured during the summer. The caverns remain at a steady 54 degrees year-round, allowing for a cool retreat during the summer months, and a warm escape during those cold Ohio winters. The staff at Ohio Caverns works together year-round to ensure every guest has a wonderful experience. Former Owner Max Evans was a pioneering force in Logan County Tourism, and was instrumental in the creation of the Logan County Visitors Bureau. The Visitor Bureau's annual award is named in his honor. Currently, Max's nephew, Eric Evans, President of the Caverns, and Manager Tim Grissom lead the team in daily operations, which include: cave tours, sales in their gift shop, and maintenance of their 35-acre park, which is complete with a playground, pavilion, and shelter houses perfect for family gatherings. Visitors to the gift shop will discover the largest rock, mineral, and fossil collection in the state. The items are imported from countries all over the world to be sold in the gift shop, making Ohio Caverns a destination in Logan County for unique gifts. The Ohio Caverns is recognized as an Ohio Natural Landmark, and is a member of both the National Caves Association and the International Show Caves Association. They also have received recognition from the Environmental Protection Agency for their efforts in protecting the groundwater in the area. They pride themselves in being stewards of the natural attraction they manage. As it is a non-renewable natural resource, they focus specifically on conservation, protection, and education, so that generations can continue to enjoy the natural beauty of the caverns. To attract visitors from a wide array of places, the Caverns utilizes a multi-faceted marketing strategy. Their marketing plan includes: brochure distribution, billboards, traditional media outlets such as newspapers, and a strong web presence. Part of their presence online can be seen through their active pages on Facebook, Twitter, YouTube, Tumblr, and Instagram. In addition, their website offers a feature that allows users to review prices, and make ticket purchases online before stepping foot on the grounds. The Caverns became Chamber members for the connections that the organization provides to its' members. 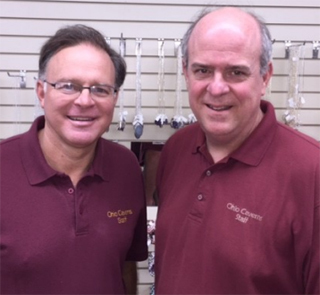 As members, the Ohio Caverns feel more "plugged in" to the community. They feel the networking events that the Chamber provides are very valuable, and allow them to meet new people and introduce them to opportunities which help to grow their business. 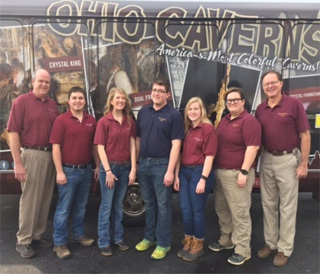 We thank the team at the Ohio Caverns for their 38 years of Chamber Membership and for their service and commitment to Logan County.